I’m pleased to announce a brand-new character for Telepath RPG: Servants of God. 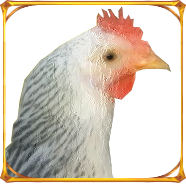 Due to popular demand, I’ve decided to include a new Easter Egg character (and I do mean egg): Buh’Baque the Ravinale Chicken. Buh’Baque is a psychic rooster with a mysterious past. Where do his powers come from? Why does he hate the Cult? What is that unusual, egg-shaped orb he sits on at night? Why does he always have to wake everyone up at 5 AM? To find out, you’ll have to play Telepath RPG: Servants of God and get him into your party! This entry was posted on Friday, April 1st, 2011 at 6:01 PM and is filed under Game Updates. This post is tagged April Fool's Day, Telepath RPG: Servants of God. You can follow any responses to this entry through the RSS 2.0 feed. leave a response or trackback from your own site.